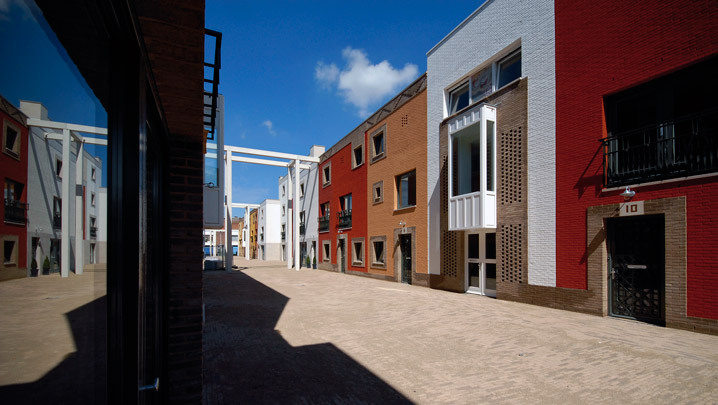 Le Medi is an urban block of 103 housing units in the 'problem neighbourhood' of Delfshaven. The original concept was developed by multicultural entrepreneur Hassani Idrissi and One Architecture. From the outside, the block registers as a solid city wall with sturdily detailed window openings. Quasi-Moorish 'city gates' give access to a Mediterranean central court, a separate world of short streets, colourful fronts and informal texture. The little streets lead into a formal courtyard inspired by the architecture of Southern Europe; the straight line of the water feature is a reference to the Alhambra. More generally, the ornamentation of plinths, brickwork, fencing and the like contain African, Andalusian and Arabic motifs.